This apartment is in Atlanta. Nearby parks include Fairburn Road Nature Preserve and Deerwood Park. Retreat at Marketplace has a Walk Score of 5 out of 100. This location is a Car-Dependent neighborhood so almost all errands require a car. Located in a beautiful, quiet, residential area, the Retreat at Market Place in Southwest Atlanta aims to provide just that: a retreat. Our lovely community is surrounded by thick woods, creating a sense of privacy and peace.Located just fifteen minutes from the Atlanta airport, we make vacationing and business travel a breeze.Take your pick from our impressive 1, 2, and 3 bedroom floor plans, bring along your dog or cat, roommate or family, settle in, kick back and relax. Explore how far you can travel by car, bus, bike and foot from Retreat at Marketplace. Retreat at Marketplace has some transit which means a few nearby public transportation options. Car sharing is available from RelayRides. 3390 Fairburn Road compared to all of Atlanta. How do you feel walking near 3390 Fairburn Road? 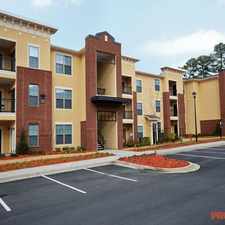 Retreat at Marketplace is in the city of Atlanta, GA. Atlanta has an average Walk Score of 49 and has 420,003 residents. Apply Today For This Lovely Home - 4855 Campbellton Rd SW! Your Dream Home Awaits - Apply Today!